Francis "Frank" Rossitano is a trucker hat-wearing, childish, sarcastic writer at TGS. After Liz Lemon, who is head writer and the protagonist of the series, Frank is the most prominently featured writer of the show-within-a-show. 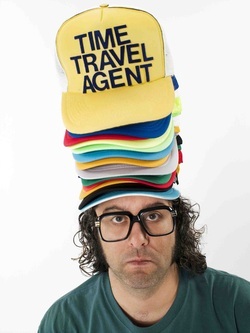 The character always appears wearing a trucker hat with a humorous phrase written on it, which is Friedlander's routine trademark in real life, and large thick-lensed glasses. He lives with his mother and his rent money goes directly to her. Frank seems to be rather childish, lazy and libidinous. He often makes fun of and plays pranks on the other characters, such as in "Jack-Tor" where he and Toofer decided to mess with neurotic Jenna Maroney by telling her about a supposed rumor that Jack was looking to fire an actor. He also seems to be clever, quick-witted and more intelligent than would appear at first glance. Based on "The Aftermath", both Liz and Pete apparently consider him "an idiot". Frank was the only member of the show's staff to be happy with Tracy Jordan joining the show since he is the only one who enjoys Tracy's movies. In "Goodbye, My Friend", Frank decided to quit TGS and follow his original career plan of being a lawyer, as he'd dropped out of Fordham University School of Law. He was inspired by Jack, who also grew up without a father. However, Frank's mother revealed to Jack that all the Rossitano men were Mafia lawyers. Because of this, they are all either in hiding or dead (Frank's father is hiding in Phoenix, Arizona). Jack eventually convinced Frank to return to TGS as a writer. In Dealbreakers Talk Show#0001, Liz is busy with her talk show and puts Frank in charge of TGS, and he gradually becomes more and more like Liz, in behavior as well as appearance. They are wearing the same outfit by episode's end. According to "Frank Talk", a blog on the official 30 Rock website purportedly written by him, he originally came to work on the show when he sent a complaint letter to The Insane Girl Show and it was delivered to The Girlie Show by mistake. Apparently, Liz mistook his letter for an "avant-garde comedy piece" as she hired him a week later. The character is noted for his colorful trucker hats which have different slogans on them. Friedlander says he makes the hats for his character himself using phrases that he comes up with. In fact, in episode S03E18 in which Liz Lemon is forced to stay home, one of her final requests before being forced out of the building was to know what Frank's hat said. Frank Rossitano is portrayed by Judah Friedlander.